A Pen and a Path is a hands-on, practical resource for people who want to explore their relationship with God through writing. Unlike other books that focus on writing itself, Sarah Stockton focuses on the discoveries made--about one's self and about God--through meditation and creative journaling. A Pen and a Path is a book for anyone who wants to explore where God has been present in the various experiences of their life, past and present. Stockton, a spiritual director and writing teacher, walks readers through thirty-five separate topics, which can be read and worked on in order or in any sequence of interest to the reader. Topics explored include religious understandings such as how God is envisioned, how religious training formed (or didn't form) the reader, and how we envision ourselves as spiritual beings. Other chapters explore life stages: childhood, teenage years, elder years, as well as marriage, parenting, and sexuality. Focusing on emotions such as grief, shame, anger, and loneliness, as well as feelings about work provide readers with the opportunity to explore nearly any aspect of their life of faith. Sarah Stockton is a writer, writing teacher, and spiritual director. She is the founder and director of centeredpath.com, a website devoted to cultivating creativity and spirituality. Her articles have appeared in America, the Christian Science Monitor, Beliefnet.com, and many other publications. She is the author of Restless in Christ: Answering the Call to Spiritual Commitment and teaches at the University of San Francisco. 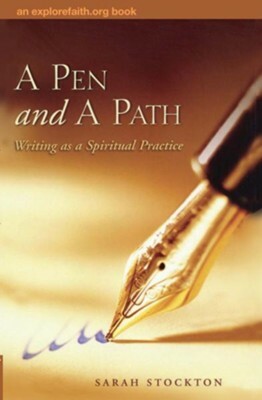 I'm the author/artist and I want to review A Pen and a Path: Writing as a Spiritual Practice - eBook.